Below is a summary of the keyboard shortcuts. 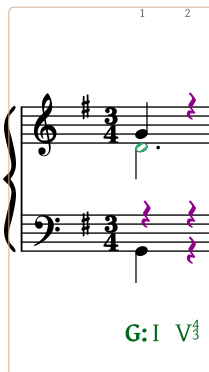 They are divided into two sections: one, shortcuts you can use when navigating the notes and rests in the notated music; two, shortcuts you can use when navigating the analysis displayed below the staff. If you are running Harmonia on a Windows machine the ⌘ key is the Control key. Below is a example of navigating a notation and inputing notes. The purple rests indicate that those rests can be moved (dragged with the mouse or moved with a keyboard shortcut) and they will turn into notes. The purple rests indicate that if those rests are moved (dragged with the mouse, or moved with a keyboard shortcut), they will turn into notes. Click on the bottom left rest, the quarter note rest in the bass voice. The green color will indicate the rest is selected. Type the letter "G" to turn the rest into a note, the closest diatonic "G" on the staff. Typing Tab will cycle the note selection down in the same sonority. Since the selection was already at the bottom, Tab will cycle back to the top, selecting the quarter rest in the soprano voice. 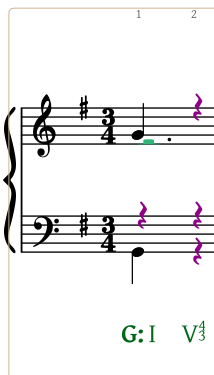 With either the down or up arrow keys (↑ or ↓), move the rest to turn it into a note, then position it to the closest "G."
Typing ⌘↓ will transpose the pitch down an octave. Typing Tab will cycle the note selection down to the alto voice. With either the down or up arrow keys (↑ or ↓) move the rest, turning it into a note, and position it to the desired pitch. Typing Tab then the letter "B" will move the selection to the tenor voice and notate the pitch B as shown. Use the right arrow key (→) to move the selectionto the next sonority.